This release will upgrade your Tekla Structural Designer installation to version number 18.1.2.41 and should be installed to ensure optimum function of the program. It includes a number of enhancements and issue resolutions as detailed below. Installation - this service pack requires Tekla Structural Designer 2018i to be installed and will upgrade this to version 18.1.2.41. [TSD-1335]1 - Foundation Design - US Head Code - Spread Footings (Pad bases) - Punching Shear - for some geometries of footing a punching (two-way) shear check was not performed when the critical failure section spanned across the footing reaching opposite sides, potentially producing an unconservative design. It is expected this was critical only in less common situations of heavily loaded footings on very high bearing capacity soil which could result in smaller plan dimension footings subject to relatively high internal design forces. For more information please see Product Bulletin PBTSD-1809-1. [TSD-1981]1 - Foundation Design - All Head Codes - Isolated Foundations - Punching Shear - for bad pases and pile caps, the punching shear perimeters previously determined for column and pile punching checks were not always the shortest possible perimeters when near to the foundation edges. The issue would be more likely to occur for columns with larger eccentricities and base/ cap geometries which placed the column closer to the foundation edges/ corners. For more information please see Product Bulletin PBTSD-1812-1. 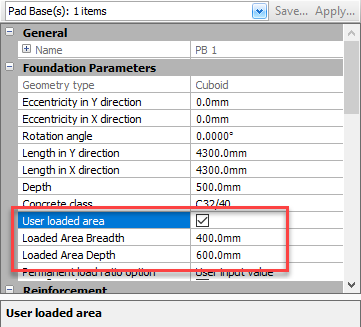 [TSD-1973]1 - Connection Design - Base Plate Connections - when minor axis shear is greater than major axis shear a warning is now issued in the Process Window when a connection is exported to Tekla Connection Designer or designed within the program as shown below. This is to bring to your attention that there is no design for minor axis shear in base plate design. For more information please see Product Bulletin PBTSD-1812-2. A number of fixes not detailed explicitly herein are made to improve performance and stability, for example the issue listed directly below. [TSD-1712]1 - Review View - Copy Properties - use of the Review > Copy Properties command to copy all properties between pad bases would result in a program crash. This has now been corrected. [TSD-1747]1 - Seismic Wizard - Eurocode - when using the site specific spectra route to obtain seismic loading, the units on the input fields for the abscissa spectra values Suser(0) and Suser(TBuser) on the site specific spectra page of the Seismic Wizard are changed from %g to ratio (of Ag ) for a more coherent relation between these and the resulting spectra as shown in the picture below. [TSD-1975]1 - Combination Generator - for Accidental Combinations the option description incorrectly referenced Table A2.5 rather than Table A1.3. This applied only to the description text and did not affect generated combinations. The description text is corrected to Table A1.3 in this release. Only checks or process which specifically used Mat Foundations spring reactions - such as the soil bearing or pile capacity checks - were affected. Other analysis results were not affected, hence neither were design results using these such as all member and slab designs, sway and drift checks etc. Total applied load vs reactions do not balance in the Process Window. Errors for cases and combinations in the Load Summary check. Solver Warnings for lack of equilibrium of node forces in the Solver Status Tree. [TSD-609]1 - Solver Model - Concrete Buildings - in rare circumstances involving sloping slabs supported by columns with alignment offsets, the analysis elements of the column and slab were not correctly connected. Where this occurred it would generally be readily apparent from excessive deflections of the slab indicating lack of connection to the column and would usually result in over conservative design of both the slab and columns. The issue is addressed in this release such that slabs and columns are correctly connected in this circumstance. [TSD-186]1 - Truss Internals - Tension Only - for members with the Truss internal characteristic, the Tension Only setting was ignored in non-linear analysis resulting in members with this checked ON acting in both compression and tension. Where this occurred it would be clear from the analysis results and could be worked around by using the bracing characteristic instead. This issue is addressed in this release and such members will now act only in tension (providing non-linear analysis is performed). During investigation of this issue it was found that the Tension/Compression only options were listed in the properties of the Truss side characteristic, for which they are not appropriate. They are accordingly now removed for this characteristic. [TSD-2021]1 - Validation Messages - Existing files - for models saved in release 2018i (version 18.1.0.45) or earlier with validation warnings/errors in the Status Tree, when opened in 2018i SP1 (version 18.1.1.29) the validation messages could be incorrect. This could be rectified by re-running validation. This issue relates only to 2018i SP1 in which it was introduced and is addressed in this release in the following manner; Validation errors & warnings are removed when a model is opened and replaced with the message "Validation has not yet been performed". [TSD-501]1 - Isolated Foundations - All Head Codes - Punching Shear Checks - the punching shear loaded area calculation of columns punching through isolated foundations has been enhanced to allow for user override of the punching shear area. This allows greater flexibility and consideration of any unmodeled base plates or pedestals. A new User loaded area property has been included for this effect in both pad bases and pile caps as shown in the picture below. [TSD-1721]1 - for LRFD design of LH and DLH joists the program incorrectly used the ASD safe load value producing an over conservative design result. The correct LRFD safe load value is now used. [TSD-1541]1 - where there was net uplift on a joist the program reported a fail and indicated that a non-uniform load exists and a KCS joist was required (in the case of K, LH and DLH joists) or "No significant loading” (in the case of KCS joist). In this circumstance a warning is now issued for all joist types where there is uplift "Net uplift detected; no design currently. Total net uplift =[V1 - V2] kips." Seismic Design - AISC 341-16 - when the Steel Design Resistance Code year is set to 2016, seismic checks to AISC 341-16 are now performed for steel members forming part of an SFRS when seismic load combinations exist. Generally these involve minor changes to the formulae of seismic checks compared to previous years, however a notable new check is that for beams in OCBF to F1.5c which are now explicitly designed for the 'overstrength seismic load’. [TSD-1534]1 - Reports - Member Forces - the Analysis Method filter method now includes options for the chase-down and seismic analysis types.